For decades, the building industry in Ohio has been trained to ventilate crawl spaces and attics. In the old days, we didn’t insulate crawlspace floors, and we didn’t air-condition houses. Crawlspaces (especially the floorframing) were warmed by the houses themselves. Now that we insulate floors, crawlspaces are within a degree or twoof ground temperature. During most of the summer, this temperature is below the dew point of the outside air, even up north. The whole point of venting a crawlspace is to remove moisture. If we could import hot, dry air from Tucson to vent moist crawlspaces in Birmingham or Cincinnati, venting crawlspaces would be a great idea. But for Cincinnati air to vent Cincinnati crawlspaces,the air needs to be dry enough to pick up moisture, and it needs energy (heat) to evaporate the moisture. This isn’t going to happen, and here’s why: Cincinnati air isn’t hot and dry. Neither is Toledo air, Tallahassee air, nor Toronto air. 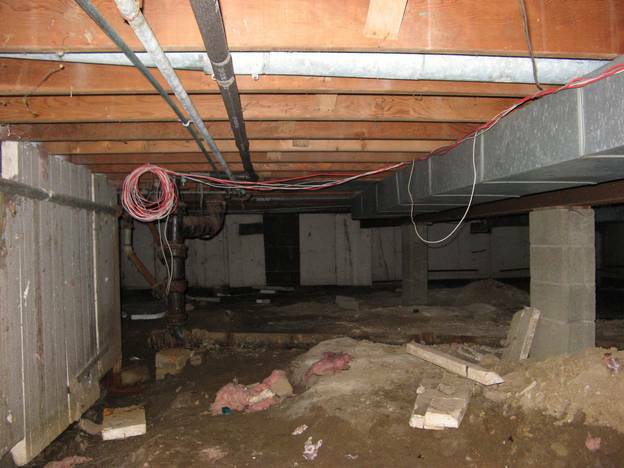 A crawlspace is just a mini-basement and should be treated as such. In fact, it’s like a basement for trolls. So how do we fix it? Don’t insulate the floor unless you have serious groundwater issues; insulate the perimeter with closed-cell spray foam and install a continuous ground cover (6-mil plastic) to keep out moisture. Make sure that you include the bandboard when you have the perimeter walls foamed. And permanantly close off the foundation vents by spraying over them or inserting a close-fitting piece of insulation boardstock. This will avoid the dreaded mushroom scenario, and you won’t have to carry large bags of pink & black fiberglass out of your crawl space like many, many others have done. In fact, don’t put fiberglass insulation in your crawlspace at all. Ever.